Disclaimer: I’m in no way responsible for what you do to your system, this is ONLY for advanced users who know a little about windows and computers and can reinstall/repair a windows installation if necessary. This has worked for me wonderfully and hopefully will for you to! It all began one day when I was helping a client optimize his system(Yes,….one of the things I do….) and I noticed that his C: Drive was nearly full. The size of the C Drive was 40 GB and nearly 1.3 remained. My client was “Technologically Challenged” (:)), so I doubt that he might have done some installation which might have eaten so much of his space. So I helped him recover space using the methods I document below so that they are useful to you too. I analyzed the Client machine using a tool called “windirstat”. It showed me a graphical Structure of the files which were very large in size. I am showing you the list of files/folders which occupied a large space on that PC or contained unwanted files and whether you should attempt to remove them or not and if possible why. First a list of locations which can be removed as they will certainly contain Temporary files and can be removed if you are not running any installations currently. If you cannot see this folder then in Windows Explorer uncheck: tools/folder options/hide protect operating system files. The Recycler folder is used only on NTFS partitions and is referred to as a location where all the deleted files go after they have been deleted by the user from the recycle bin. This is the reason why we can still restore the deleted data in the Windows. You will be surprised at how sometimes this folder can grow to humongous proportions.You can delete this folder if you do not have any intention of recovering the deleted files. This folder will be recreated when you delete some new file. NOTE: DON’T DELETE THIS FOLDER, JUST ALL THE FILES INSIDE! This folder uses a LOT of hard drive space, it holds a backup of every system file that windows uses. Deleting this will cause a SFC error when you replace a system file instead of windows putting back the original file. For people who want to mod there system, this is a good thing, others just avoid touching this folder. This folder contains the files which are downloaded for updating your windows system when you have automatic updates enabled and can be removedonce that update is successful. Do not delete this – it will be used in future by Windows File Protection, if enabled– but what you can do is that you can compress it to save about 200MB of disk space. R-click on it, Properties, click the Advanced button, and select ‘Compress’. The problem is that if you remove it, you may at some future date be asked to insert the Windows installation CD if Windows believes it needs to install or repair an operating system file and it might result in an issue then. This folder is best left alone as it is a migration folder for hotfixes (aka: windows updates) and while deleting it may not cause Windows to crash it could lead to problems when using updates in the future cos The subfolders contained therein determine the branch of an update. These $uninstall—-$ folders are used whenever you want to uninstall a windows update. If you delete them, you cannot uninstall the update(s), but if the updates are working fine for you, there should be no reason NOT to remove them. So you can safely delete this folder when you are sure that the updates were applied properly. This Folder contains the installers / uninstallers software that are installed on Windows and also all the installers for any updates to Windows. You should avoid messing with this folder because you will not be able to uninstall some software without their uninstallers, if you delete them. The only safe method to remove Installer files is to use the MSIZap Utility but that is for advanced users. NOTE: DON’T DELETE THIS FOLDER (if you ever decide to delete) DELETE JUST ALL THE FILES INSIDE IT! This folder uses a LOT of hard drive space, it holds a backup of every system file that windows uses. Deleting this will cause a SFC error when you replace a system file instead of windows putting back the original file. I would say that avoid this folder unless you are an advanced user. This folder will be present only in the PC’s of those who use Visual Studio, this contains trace files of every project you have ever opened. You will be surprised at the amount of space you will gain on deleting the contents folder considering that each trace file has a very huge size. Safe to remove Contents. Apart from this places what you can also do is go to drive properties and run Disk Cleaner for that drive. 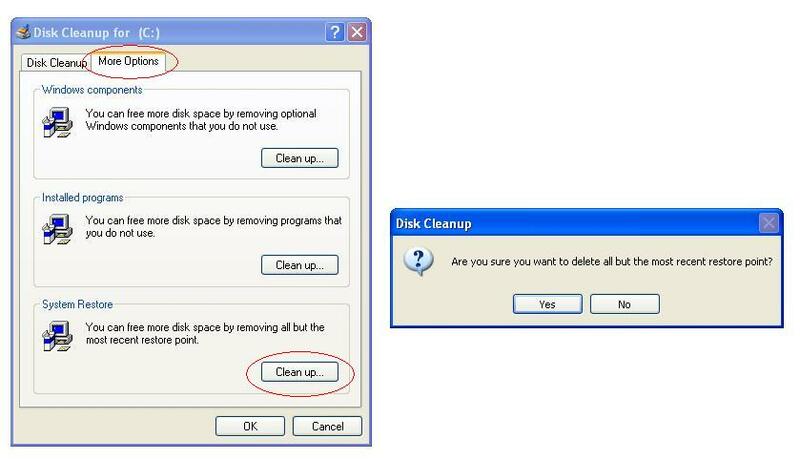 Once you do that, Go to the “More Options” Tab and click on “Clean up” button under System Restore. Also, Compressing the Unused files will also save you a considerable amount of space in the long run. Just understand that these are most of the folders, if not all, where you will find files hogging space and cleaning the applicable folders will certainly help you gain space. Do comment below if you need any assistance. If you remove the entire folder C:\WINDOWS\SoftwareDistribution, it will erase your Microsoft Update history (although Microsift Update will still know whether or not your OS has been updated for any given update). Thanks for your excellent article. By the way (and I realize this is not what you wrote about), if you remove the entire folder C:\WINDOWS\SoftwareDistribution, it will erase your Microsoft Update history, listed on the Microsoft Update web site (although Microsoft Update will still know whether or not your OS has been updated for any given update). But I do not think it will prevent you from having the ability to uninstall an update. Thank you for catching that…you sure have a quick eye. Updated the post. To advertise here, Use the Contact Form in the about page.